Time for a book talk. Thanks to Mrs. Jump's Class for hosting this linky! This book is one of my favorites for many reasons. For one, it is turned sideways to read...how fun. Two, it teaches some good lessons. Three, it gets kids in our garden and connects them to great book. Here is a video to watch the reading of the book. Then you'll know why this is one to have in your collection! I also have a fun freebie for you that I made for my gardening class this week. Enjoy! Thanks for sharing the book, Renee! I am loving your blog design! I just found your blog. It is really cute! 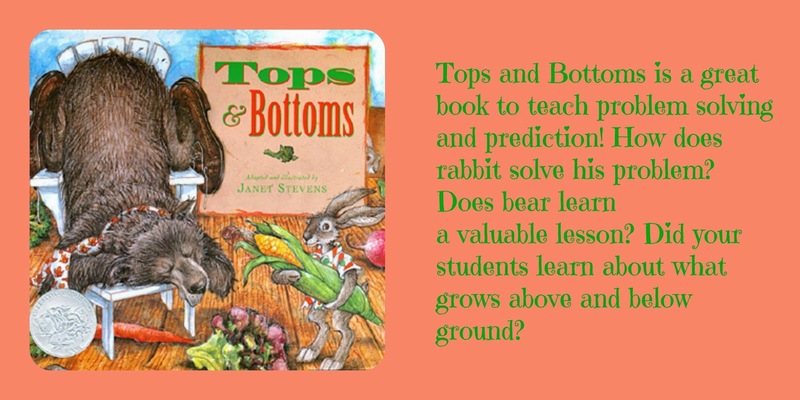 I used Tops and Bottoms in first grade and the kids loved it.